Where did the idea for a neighborhood book exchange begin? A collection of books with an open invitation to exchange is not an uncommon sight, especially in hostels and coffee shops. However, the idea of installing a book exchange as a free-standing structure in a neighborhood is different. And we wonder where that idea originated. Since our study began, we have been curious about the first Neighborhood Book Exchange (NooX). It is not easy to identify. Some NooX are modest, local initiatives; it is difficult to find records of their existence beyond their perch by a sidewalk. But we know they have been appearing around North America for nearly twenty years—at least. And we suspect they may be spreading from several different origins. The search is even more complicated because we need to confirm that each candidate NooX meets our criteria for a neighborhood book exchange. This criteria helps ensure that our account captures the same type of book exchanges. Briefly stated, a NooX has to be a physical container that invites passersby to take a book or leave a book; this book exchange must be accessible to the public right of way 24 hours a day, 365 days a year. For a complete description of how we define a neighborhood book exchange, please refer to our post outlining our definition of NooX. But with inconsistent records of the book exchanges, it is difficult to evaluate whether they can be considered NooX or not. Our search to date suggests that NooX have emerged independently on three separate occasions. However, we doubt that we have identified all the original or oldest instances of NooX. But here we will outline the three cases we have identified, and describe the motivation and influence of each one. The Share-It Square Lending Library in Portland, OR. In 1996, a neighborhood in Portland transformed the intersection of Sherret Street and SE 9th Avenue into a gathering place. They painted the intersection with a colorful mural, and constructed neighborhood kiosks on each corner—a children’s playhouse, an information board, a tea station, and a neighborhood book exchange. At the children’s playhouse, kids could play with assorted toys and games. Neighbors could post notices about services and events on the information board, and, a few years later, they could exchange fresh produce at a kiosk alongside. At the tea station, neighbors could prepare a cup of tea; a solar-powered thermos provided hot water, and neighbors contributed an assortment of mugs and teas. The neighborhood book exchange, or “Lending Library” as the neighbors called it, invited passersby to take a book or leave a book. The transformation of the Sherret Street intersection, or “Share-It Square”, was the first of many placemaking projects in Portland. After remodeling their neighborhood, Mark Lakeman, an urban designer, and several other Share-It Square neighbors founded the City Repair Project. The goal: to help other neighborhoods transform their public spaces into gathering places. The City Repair Project offers council and support for neighborhoods that are determining what public amenities they want to create and share. The Lending Library still stands at Share-It Square. Over the last eighteen years, it has hosted a prolific book exchange and inspired many more. According to an article in The Oregonian, other Portland neighborhoods have installed their own lending libraries after using the one on Sherret street. And, based on our study of neighborhood book exchanges, we know that at least one NooX in Vancouver is a direct descendant of the Lending Library in Share-It Square. This neighborhood book exchange is the oldest and longest standing NooX we are aware of to date. The Logan Square Community Book Exchange in Chicago, IL. As Duggan explained to the Chicago Reader, the newspaper box was ideal for the book exchange. It was robust and weatherproof. And it could accommodate a small collection of books. Duggan hoped to introduce more community book exchanges to Chicago; hence the addition of “Logan Square Branch” to the name. He was hoping to find more newspaper boxes, though not necessarily Chicago Reader boxes. Within four years of its installation (or abduction), several other NooX were installed in Chicago neighborhoods. 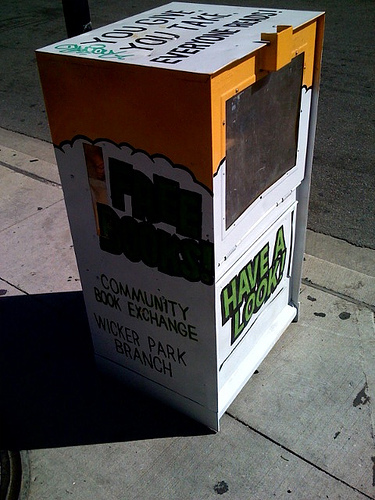 In 2010, Shareable published an article featuring the Logan Square Book Exchange. The article described the growing appeal of the book exchanges—especially book exchanges that revitalize derelict newspaper boxes and telephone booths. It celebrated these NooX for demonstrating how neglected facilities could be transformed into community amenities. The first Little Free Library in Madison, WI. The story of Little Free Library is more familiar. In 2009, Todd Bol installed a small, schoolhouse-shaped hutch on the lawn of his home in Hudson, WI. He filled the hutch with books, and invited neighbors to take a book or leave a book. The book exchange was a tribute to his Mother, a former school teacher and avid reader. 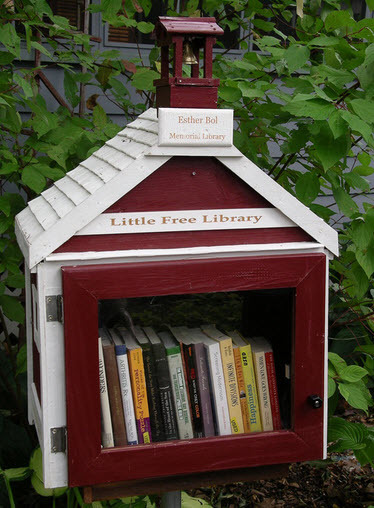 The little library quickly became a popular neighborhood destination. Eventually, Todd and his friend, Rick Brooks, founded the Little Free Library organization to support those who wanted to initiate their own book exchanges. In 2010, they installed the first official Little Free Library in Madison, WI, and they began promoting Little Free Libraries as tools to promote literacy and build community. The media was transfixed; the story of Todd Bol and his Little Free Library became ubiquitous, and there was a dramatic surge in Little Free Library installations. 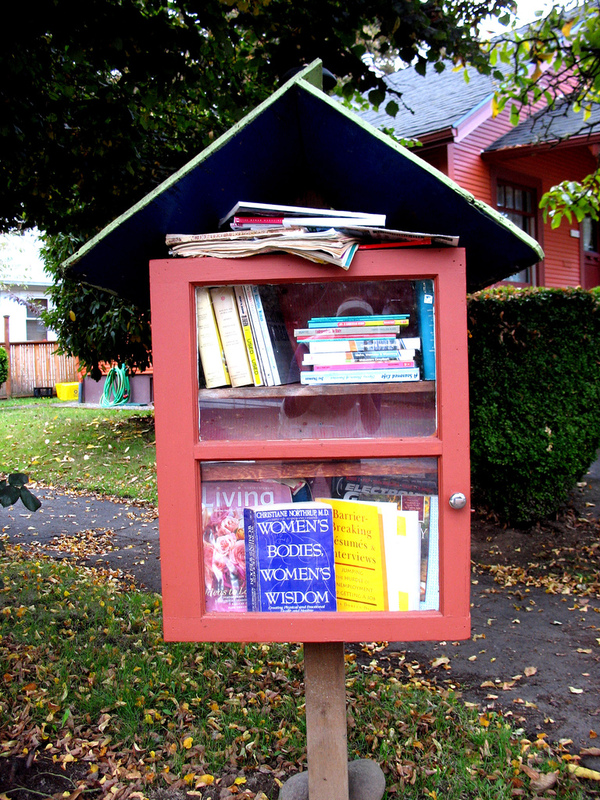 The Little Free Library organization offers support and resources to help people create, install, and steward a book exchange in their neighborhood. These three neighborhood book exchanges indicate that NooX may have emerged independently on several different occasions. However, we have not completed a rigorous investigation of NooX history. There may be connections and influences that are not immediately apparent. But, at this time, these three cases suggest several different NooX lineages. These cases also evince the diversity of NooX motivations and implementations. Neighborhood book exchanges are installed for many different reasons. In our experience, most NooX are grounded, local initiatives. NooX are created by the stewards for their neighborhood; consequently, NooX reflect the goals of their stewards, and the dynamic of their neighborhood—as demonstrated by each of the NooX presented here. Neighborhood book exchanges are constantly reinvented. And, consequently, the history of neighborhood book exchanges is much longer and more complex than typically acknowledged. Our effort to unravel the history of neighborhood book exchanges continues. Do you know of an original neighborhood book exchange that we haven’t mentioned? Let us know! This entry was posted in Research Fieldnotes and tagged History, Little Free Library, Neighborhood Book Exchange. Bookmark the permalink.